I’ve long held this theory about the relationship between trust and chaos (which often results in conflict). The theory started out like this. Trust and chaos have an inversely proportional relationship. As trust nears zero, we’re all going to be in serious trouble. This statement implies that as trust goes up, chaos decreases and vice-versa. The more I think about it, the more I think this isn’t exactly right. How could it be right? If it were this simple, trust would be universal, right? And we know this isn’t the case. Not even close. I do think there is a direct relationship between trust and chaos. Trust is at the heart of most, if not all, of the conflicts and problems on this little planet. But the relationship is far from simple. 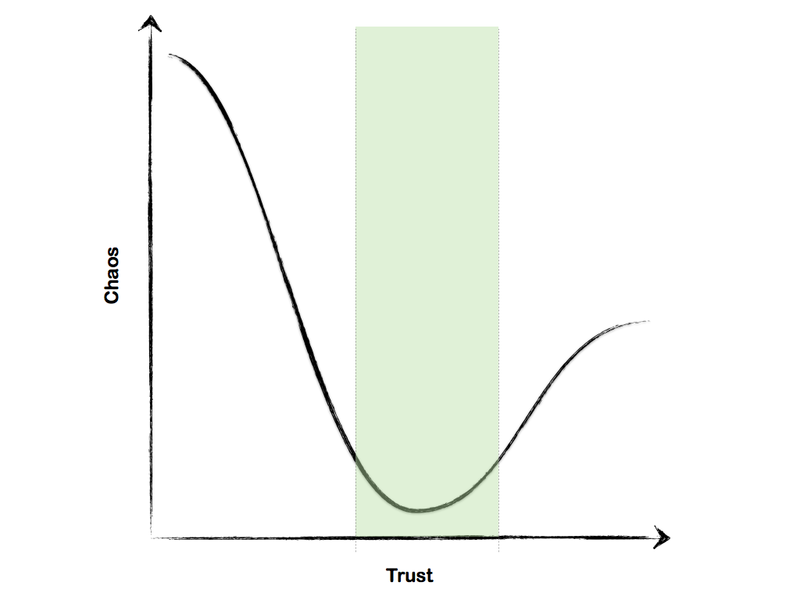 There are two ways I’m now thinking about the relationship between trust and chaos. The first is a simplified categorization of trust. This categorizes trust as earned and / or granted. Trust can be earned but not granted. Trust can be granted but not earned. Trust can be earned and granted. Trust can be neither earned nor granted. Only one of these situations minimizes conflict. A combination of these situations can compound conflict or chaos. For example, if one member earns but isn’t given trust while another is given without earning, ugly conflict is sure to brew below the surface. Many workplaces have their share of empowered incompetents. Conflict in these environments is probably significantly higher than environments with equitable distribution of trust. Ideally, trust is granted until removed (temporarily) as a consequence. Which workplace do you think operates at potential? The workplace with low trust / misplaced trust or the one with high trust / equitably distributed trust? Mario Vittone, a friend of mine, recently retired from Coast Guard active duty. Back in 2008, he wrote a fantastic article titled “The Missing Competency“. In his article, Mario writes that trust is the missing competency in leadership development. The component of leadership that is seldom spoken of in formal development programs and rarely practiced with intent. He gives some great advice for increasing local trust, in particular methods you can use to increase your personal trustworthiness score. Read Mario’s stuff! You won’t regret it. But I see local trust and system trust differently. I see tight coupling with local trust and loose and complex coupling with system trust. Think about how much you trust the U.S. Congress this year or last year. Now compare that with two decades ago, if you can remember back that far. Is your trust of that system component higher or lower? Now think about large banks and Wall Street. Do you have higher or lower trust in these systems than you did a decade ago? System trust isn’t universal and it’s far more complex than local trust. 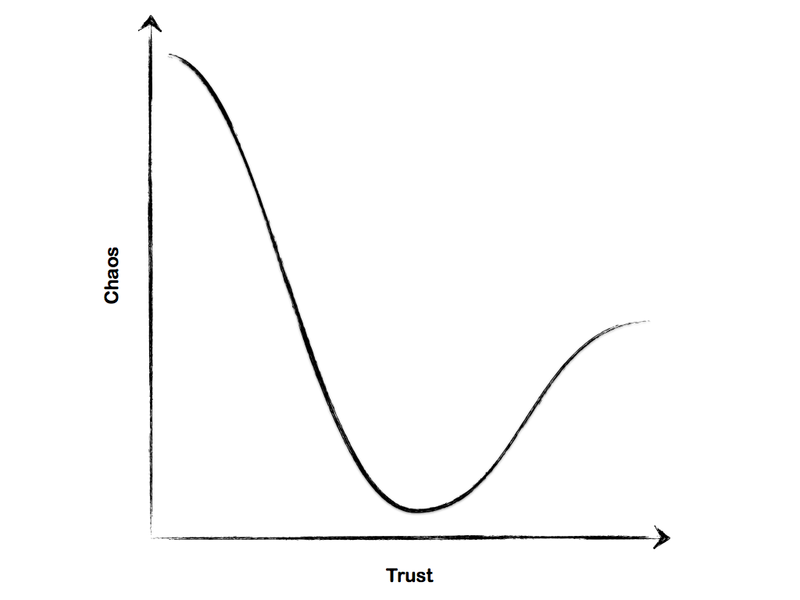 I’ve revised my original theory about the relationship between trust and conflict or chaos to look more like a curve. And this curve isn’t the same for every context. Trust seems to have a band of effectiveness on average. While I think we should 1) grant trust more often and 2) push for more trust, I don’t think 100% trust is the answer in every context. There is likely a threshold of trust that provides the best return on energy used to build the trust, beyond which conflict could be higher. For example, consider the much maligned position of IT services within most organizations. Opening up 100% trust provides a risk calculation that is uncomfortable or unacceptable to those that govern IT resources and are charged with protecting the organization, its business, and its data. In this situation, zero trust is completely counterproductive (though common). 100% trust (though rare) opens the organization to risks that IT management believes are unacceptable. So the default response to many requests for an increase in trust or access is no. Right or wrong, this is a common position. It’s a balancing act that tends to err on the side of caution. Within any optimized trust band (best discovered through experience and honest evaluation), there lies a point of diminishing or negative return. The hard part is figuring out where this balance is and leaving both benefit of the doubt and options to increase the window of trust when the returns are positive. This becomes a game of trade-offs. One of min-max where you’re aiming to maximize the positive and minimize the negative. It’s almost never simple. Low trust makes things that should be easy excruciatingly hard to get done. Unbalanced assignment of trust creates subsurface conflicts and can destroy a team’s motivation. How do you maximize trust and minimize chaos? Do you think that the inhabitants of the meteor trusted the Universe not to drop them on Chelyabinsk? Funny, Mike — as I was reading, I was thinking about how much this relates to Multipliers (a leadership book I’ve read and continued to come back to over the past 6 months). There’s a lot there about developing people through delegating, investing in them, etc… and underlying all of it is an implication of trust in your reports, trust in oneself as a leader, and trust in the system to give everyone involved the freedom to make mistakes.